⟩⟩⟩ Broadcast quality, professional 4-in-1 or 8-in-1 SD and HD audio & video encoding and multiplexing device with very stable and powerful functionality. H.264 encoder with 4 or 8x HDMI inputs, multiplexer and streamer combined. It has an ASI input and can also multiplex the input TS with the 4/8 encoded SPTS content to generate a MPTS output. MPEG1 Layer II audio encoding format, supports audio gain adjustment or AC3 pass through (Optional: LC-AAC and HE-AAC (V2) audio encoding). Ultra low bit rate encoding. 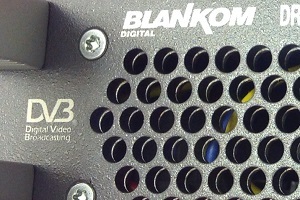 BLANKOM EMU-4230/EMU-8230 encoder accepts 4 or 8 channels digital HD and SD video and audio signals. Video encoding format is H.264. The output is ASI and IP simultaneously in broadcast quality. The BLANKOM EMU-4230/EMU-8230 series 4-in-1 or 8-in-1 H.264 HD Encoder is our professional SD and HD audio & video encoding and multiplexing device with powerful functionality. It has 4 or 8 independent channels of HDMI input interfaces. It supports H.264 video encoding and MPEG-1 Audio layer 2 audio encoding (LC-AAC and HE-AAC (V2) optional). Its each channel can reach an ultra low bit-rate. Moreover, it has an ASI input and can multiplex the input TS with the 4/8 encoded SPTS to generate a MPTS output. 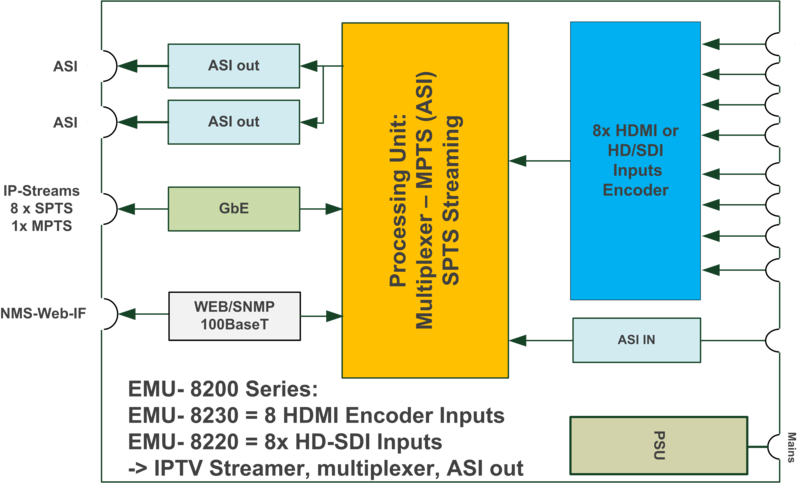 H.264 encoder, multiplexer and streamer for broadcasters with 4 or 8x HDMI inputs. Feeding DVB-T/T2, DVB-C/C2, DVB-S/S2 modulators and IPTV gateways with live content.